Eva Mitera paintings principally focused on the theme of landscape, natural and metotological phenomena, images alternately abstract and figurative with evocations of motif. These atmospheric images resist simple perception and analysis both based on memory of the observation taken from nature and transformed onto canvas. It is vital to Eva to capture the subtle changes of weather and the elemental forces of nature, the dramatic, the cataclysmic factor, the tenions and vibration of landscape. Paintings are untitled or with laconic titles for it should be felt not interpreted. Large scale of the oil images play an important role in creating a desired dramatic sense of nature. 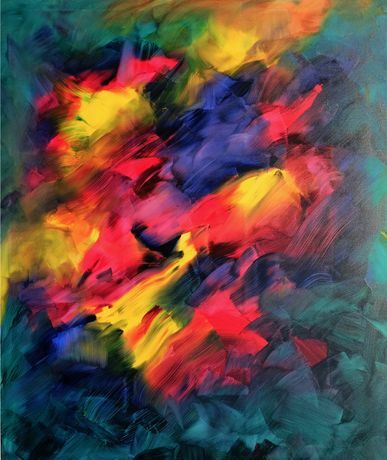 Equally important as the motif is the process of creating, exploring the possibilities of color and light, both in traditional oil technique of the Dutch masters and spontaneous strokes of brush “alla prima” characterized by an abstract overall structure.